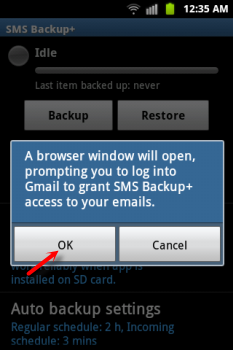 How to Backup SMS and MMS on any Android Device? From our computers to handsets, we have always been told to keep a backup of data on our digital devices. Problem is that it’s not a false alarm, because time to time we do get in to the misery of losing some of our important data. So today we would guide you along the way of backing up your precious and perhaps, memorable SMS and MMS stored in your Android phone. There are a handful of free apps at Google Play Store that help you to backup SMS and MMS on any Android device but we would be trying one called SMS Backup+. The reason of choosing this free app is majorly because it supports your Gmail account, which means it sends the data to your Gmail account, hence making it all secure. SMS Backup + not only does backup of your SMS & MMS but also stores the call log entries. The backup is stored under a separate label in Gmail/Google Calendar with a tag of SMS, MMS, Call logs. The whole process of creating backup and then restoring the data is pretty easy and we would make sure to make it even easier for you by going through the whole process. 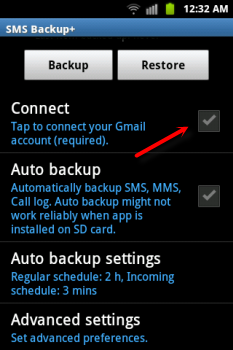 Note: to let the SMS Backup + work flawlessly you would be needed to enable IMAP in Gmail and also set a correct timezone. 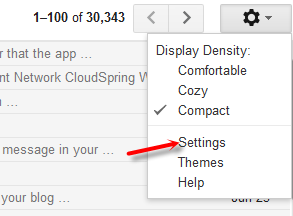 To enable the IMAP feature, sign into Gmail, open Settings and then click on the Forwarding and POP/IMAP tab. Click on the Enable IMAP and Save Changes. 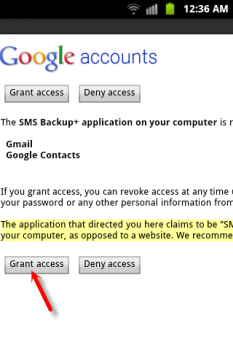 A browser window will show up asking you to grant the access; once done you will be ready to backup SMS, MMS and Call log entries in your Android handset. 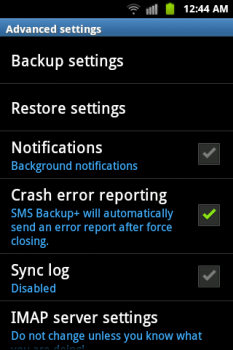 To backup SMS & MMS in Android, just tap on the Backup button at top. Confirm it in the pop up and the process will start. Right beside the Backup button is located Restore option, which can be tapped on to restore your data easily. In the image above you can also see a function named Auto backup which automatically creates backup of your data – this function might not work properly if SMS Backup + app is installed on the SdCard. The auto backup settings can be adjusted by tapping on the Auto backup settings. The Incoming schedule in the image below gives you an option to set the time to backup SMS after its arrival, say: 3 minutes. 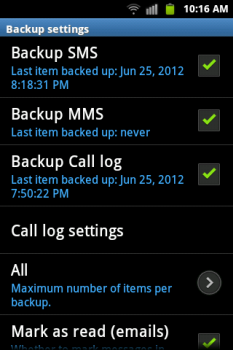 Another setting in SMS Backup + is the control over your data usage. Check the Require Wifi to only backup when connected to a WiFi network. After the Auto backup settings comes in the Advanced settings which let you choose the items to be restored or made a backup of. Under the Backup settings and Restore settings check the item/s that you want to backup or restore, leave them unchecked otherwise. Ta da! Now you do not need to worry about your dear SMS, MMS and call log entries. 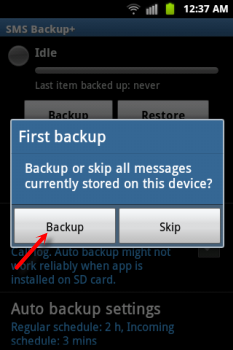 It’s before rooting your Android device or just the regular backup, SMS Backup + would never disappoint you. Download this wonderful SMS Backup + app from Google Play!